Within the pages of What is The Answer? 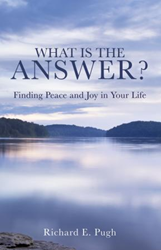 Finding Peace and Joy in Your Life ($15.99, paperback, 9781545610640; $7.99, e-book, 9781545610657), readers will gain a much better understanding of the general content of the Bible. The book encourages readers to begin their own reading of the Bible. A native of upstate New York, Richard Pugh worked more than 40 years in the healthcare field, serving the last 30 years as a hospital CEO. He is a Vietnam veteran and is currently vice chairman of the St. Mary’s Hospital Board in Waterbury, Connecticut. He graduated from Ithaca College and received his master's degree in business administration from George Washington University. Xulon Press, a division of Salem Media Group, is the world’s largest Christian self-publisher, with more than 12,000 titles published to date. Retailers may order What is The Answer? through Ingram Book Company and/or Spring Arbor Book Distributors. The book is available online through xulonpress.com/bookstore, amazon.com, and barnesandnoble.com.